Don't let their recent gains scare you. These three stocks have plenty of upside. As an investor, few things feel better than seeing your favorite stocks soar. On the other hand, steep gains can not only tempt shareholders to take profits off the table prematurely, they can also prevent new investors from buying out of fear of a pullback. Much of the time, though, investors would be best served by either holding or adding to their biggest winners. To that end, we asked three Motley Fool contributors to each find a stock that has doubled and still has room to grow. Read on to learn why they chose Alteryx (NYSE:AYX), LGI Homes (NASDAQ:LGIH), and Veeva Systems (NYSE:VEEV). Steve Symington (Alteryx): Shares of Alteryx have already soared more than 140% over the past year, and they're up 336% from the company's initial public offering in early 2017 -- a rally most recently fueled by the data science and analytics software leader's stellar third-quarter results announced last month. To be sure, when all is said and done in 2018, Alteryx expects its full-year revenue will arrive at just over $200 million, good for growth of more than 50% from 2017 as thousands of new customers (it ended last quarter with 4,315 customers, up 41% year over year) realize the utility of its easy-to-use platform. "We intend to continue to invest in our organization to capitalize on industry tailwinds and build a foundation focused on relentless value for our customers," added Alteryx CEO Dean Stoecker during last month's earnings call. But with a market cap of less than $4 billion today, this relatively small company is only just getting started. Management estimates the global big data and analytics software market stands at roughly $49 billion -- a massive total from which Alteryx can continue grabbing market share as it builds on its products and expands its reach for years to come. For investors willing to buy even after its rise, I think Alteryx will ultimately prove it's a winner that can keep on winning. Reuben Gregg Brewer (LGI Homes Inc.): LGI Homes' stock is down 40% in 2018, which would seem to make it an odd choice here. But it's up nearly 200% since the start of 2015. 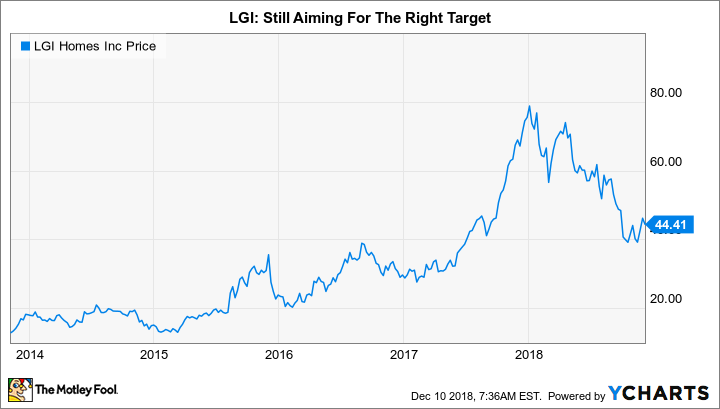 And while the slowdown in the homebuilding industry is taking its toll on LGI, the company's focus is unique and it is still putting up strong numbers. LGI specifically caters to renters looking to own. Effectively, the company builds starter homes, but there's more to the story than that. LGI's entire marketing, construction, and sales effort is geared to reach renters and provide affordable prices (with ownership costs that rival rent payments). For example, to keep costs in check, LGI offers multiple floor plans but does not allow individualization. Third-quarter home closings were down nearly 7.5% year over year. November home closings were down nearly 9%. That's the impact of a downturn in the cyclical homebuying market. But through the first 11 months of 2018, closings were still up nearly 11% overall. Financial results through the first nine months of the year, meanwhile, were very strong, with home sales revenue up 26.5% and net income advancing by 45%. Part of that strength came from an acquisition, which has helped support LGI's expansion plans. The company currently operates in 26 markets, with a long-term goal of becoming a top-five homebuilder. And while home sales are slowing in the face of rising rates, there's still a dearth of low-priced homes available to first-time homebuyers. So big opportunities remain as younger generations start families and shift toward home ownership over renting. Many thought that wouldn't happen, but now that it is, LGI is well positioned to serve these buyers and continue to grow its business. And long-term investors can use this pullback to tag along for the ride. Leo Sun (Veeva Systems): Veeva, which was co-founded by former salesforce.com (NYSE:CRM) SVP of Technology Peter Gassner, applies Salesforce's cloud-based CRM (customer relationship management) business model to life science companies. The Veeva Commercial Cloud provides a CRM platform that helps drug companies manage customer relationships, and the Veeva Vault helps them track industry regulations, clinical trials, prescribing habits, and other data in real time. Veeva's CRM platform is powered by Salesforce, and its services are integrated into Salesforce's marketing and service clouds -- so it basically leverages Salesforce's "best in breed" cloud services to dominate an underserved niche in the healthcare market. Veeva's first mover's advantage in this space helped it secure over 600 major customers, including pharmaceutical giants like GlaxoSmithKline and Novartis. Demand for its services has been surging, and Veeva continues to cross-sell new services -- including a data warehouse, an employee training platform, and a cross-platform UI -- to lock in customers, boost its revenues, and widen its moat. As a result, Veeva's total revenue rose 37% annually to $630 million during the first nine months of the fiscal year. Veeva is also profitable by both non-GAAP and GAAP measures. Its non-GAAP net income surged 67% to $183 million during those nine months, as its GAAP net income rose 44% to $159 million. Veeva's stock definitely isn't cheap at more than 50 times forward earnings, but its dominance of its high-growth niche could help it surge higher -- even after it rallied 250% over the past three years. We definitely can't guarantee these three stocks will extend their meteoric rises. But given Alteryx's massive addressable markets, LGI's unique industry position, and Veeva Systems' dominance within its high-growth specialty, these contributors think chances are high that the companies continue crushing the market from here.